When I think of growing up in St. Pius X parish in Rodgers Forge, I think of Msgr. Thomas Baumgartner. He wasn’t a monsignor then—he was Father Baumgartner—but he was always present, always smiling. He had an amazing voice and you knew he loved his parish and loved being a priest. His name was clearly German, but we knew he was Irish. After all, he prayed the Irish Blessing at the end of every Mass. Decades have passed since those days at St. Pius. Msgr. Baumgartner went on to St. Ursula, and my Irish dancing group—perhaps not coincidentally—practiced in the church hall there for a while. People say Baltimore is small, but I think “Catholic Baltimore” is smaller and “Irish Baltimore” smaller still. I crossed paths with him from time to time, always aware of where he was serving, though I never knew him well. 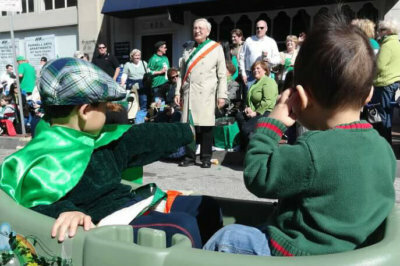 A few years ago, my sister Treasa, who is involved in the Emerald Isle Club, invited my husband and me to bring our sons and march in the St. Patrick’s Day Parade. It was a beautiful sunny day, though chilly—as it often is—so we bundled up our boys, loaded them into a green wagon, and followed the sound of bagpipes down to Mount Vernon. Then we pulled the wagon through the streets of Baltimore. 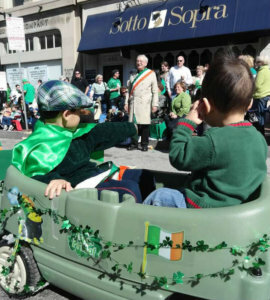 We enjoyed a beautiful day at the parade, as I introduced our Chinese-American children to our family’s Irish-American roots. Msgr. Baumgartner was there, marching as I’m sure he did every year. Last week when I heard Msgr. Baumgartner had died, I thought of that day, of the sounds and sights and celebration of the parade. Msgr. Baumgartner was proud to be Catholic and proud to be Irish, and there is nothing like Baltimore’s St. Patrick’s Day Parade. I like to think that when Msgr. Baumgartner reached the pearly gates, there were bagpipes blaring, dancers twirling around as they jigged and reeled, and maybe a few green dogs dancing on their hind legs. Maybe Heaven is a bit like Mount Vernon on a beautiful parade morning. Parade day is often frigid and blustery or chilly and damp. This year, though, it seems that Msgr. Baumgartner may have interceded for Baltimore and sent us a perfectly lovely day.